Hometown performers were the hometown favorites at Celebration in Brass held at Ankeny High School in Ankeny, Iowa, on Wednesday night. Aside from the early morning severe weather, Mother Nature cooperated once the corps took the field. Ankeny natives Andy Glitner of the Cavaliers trumpet line and Patrick Baker of the Colts bass line were back in their hometown to perform for a packed house full of screaming fans. The Cavaliers were victorious in Ankeny last night. According to Glitner, "The audience was way into our show and the corps fed off of all their energy. It was a great performance." Glitner also said it was the first show for the corps to unveil the new ending to their show in preparation for THE Midwest Championships this weekend. The Cavaliers, the champions of the evening, scored a 87.20 over the Colts, who scored a 73.10. Baker, a first-year member of the Colts bass line, also enjoyed the hometown crowd. "The show was really good and it was one of the loudest crowds yet!" He said that there were about 15 of his family and friends in the audience. "I think they liked it -- they got pretty excited!" 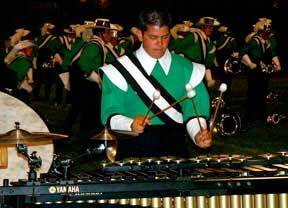 The Racine Scouts (40.10) from Racine, Wis., recently added a member to their drum line staff. According to program coordinator Andrea Birbilis, Shilo Stromen, from Loveland, Colo., answered all the questions correctly, and he is working out fabulously. "He seems to fit in well with the rest of the staff," she said. "The drummers are doing better already now that they have someone in front of them." Stromen said he is having a lot of fun with the Racine Scouts and that being a Scout instructor is a great learning experience. "The biggest challenge is coming in during the middle of the season. There is so much to fix now and not much time left," Stromen said. Rachel Dement, a first-year member of the Colt Cadets (35.20) from Dubuque, Iowa, debuted playing the character the cowardly lion in the Colt Cadets' 2003 show entitled "Oz Fest: Somewhere Beyond the Rainbow" last night. She said her new role was hot and tiring, but she also felt "the show was a lot better and a lot more together. The brass sounded louder too. I think the audience really liked the vocals!"